Global investors representing more than USD $6.5 trillion today called on six of the largest companies in the USD $570 billion global fast-food sector to act urgently on the climate and water risks in their supply chains. The investors have sent letters to Domino’s Pizza, McDonald’s, Restaurant Brands International (owners of Burger King), Chipotle Mexican Grill, Wendy’s Co. and Yum! Brands (owners of KFC and Pizza Hut). The letters, facilitated by the sustainability organisation Ceres and the FAIRR Initiative, ask companies to explain by March 2019 how they plan to enact meaningful policies and targets to de-risk their meat and dairy supply chains. More than 80 investors have joined the letter, including BMO Global Asset Management (Canada), Aviva Investors (UK) and ACTIAM, Aegon Asset Management and NN Investment Partners (Netherlands). The engagement is also supported by members of the Interfaith Center on Corporate Responsibility (ICCR) who have convened long-standing engagements with these companies on a host of environmental and social concerns – including deforestation and the water impacts of animal agriculture. 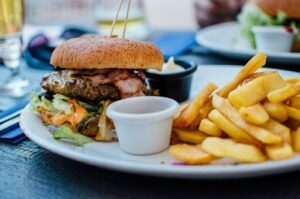 “Every day around 84 million adults consume fast food in the US alone, but the inconvenient truth of convenience food is that the environmental impacts of the sector’s meat and dairy products have hit unsustainable levels. To put this in perspective, if cows were a country, it would be the world’s third largest emitter of greenhouse gases. Adopt a supplier policy with clear requirements for suppliers of animal protein products to report and reduce greenhouse gas (GHG) emissions and freshwater impacts. Publish quantitative, time-bound targets to reduce the GHG emissions and freshwater impacts of their own meat and dairy supply chains. Commit to publicly disclose progress on these targets annually. Undertake a climate scenario analysis in line with the recommendations of the Task Force on Climate-related Financial Disclosures (TCFD). A new investor briefing from FAIRR, also released today, highlights the environmental impact of the meat and dairy producers that supply the fast food sector. Agricultural emissions, including those from meat and dairy, are on track to contribute around 70% of total allowable GHG emissions by 2050. This will create an 11-gigaton GHG mitigation gap between projected emissions and the target level required to keep global warming under a 2°C threshold. The livestock sector is also estimated to use approximately 10% of annual global water flows. The investor letter highlights that the meat and dairy industry currently has limited water and climate policies and goals in place. Analysis by the Coller FAIRR Index found that more than 70% of meat and livestock index companies do not have targets for reducing GHG emissions. The meat sector was also shown to be the lowest performing industry in Feeding Ourselves Thirsty, a 2017 analysis of water management practices released by Ceres, and is a major source of nitrogen and phosphorus pollution globally. Hey Buddy!, I found this information for you: "Global investors turn up heat on fast food companies to tackle climate and water risks". Here is the website link: https://www.duurzaam-ondernemen.nl/global-investors-turn-up-heat-on-fast-food-companies-to-tackle-climate-and-water-risks/. Thank you.